I so struggled putting this outfit together. I like the end result but it took me several iterations to get it to this point. I began with the skirt and tried about 5 or 6 different tops until I got something that I thought looked fairly good. The skirt is a new acquisition. I got it on my last shopping trip and I think it is super cute. I went looking for another jean skirt being as I so enjoy wearing the other one I have. I picked this one up for about $15! What a steal. I will have to see if it holds up for the long term. Did I mention that I think I am having a bad hair day in the photo above? Yeah well, I am kind of thinking that a wig upgrade is in my not too distant future. I am beginning to think that wigs have about a years use while in my possession. With the photo above, it is one of the new ones taken with my new camera! I am so excited about it, I can't stand it. I have been bummed with the quality of my previous one and have been looking for a nice upgrade. I decided on a Canon EOS Rebel T3i. Again, I got a heck of a deal on it by buying it from Canon as a refurbished device. I saved quite a bit on it and it works wonderfully! So you might have to bear with me while I share more than a few photos. Here is a close up of the top portion of my outfit. I like the details of the lace tank along with the woven belt. This photo shows one of the small little things that bugged the heck out of me with my other camera. My point and shoot lacked any ability to focus on what I wanted to focus it on. It just sort of did it's own thing and you would cross your fingers and hope. Part of the reason I had such a hard time choosing a good top to wear with this skirt is because on this day Jules and I were getting our nails done again. I had several cute tops picked out, but the arms were too long. I needed to wear something with shorter arms, to be able to have them not get in the way during my manicure. I know, big issue, huh? Well I hate having to shove my sleeves up my arms and totally stretch them out. I have rather big forearms. Ah, life's little struggles huh? What else?????? Not much really. But how about, I find it surprising how many people still seem surprised that I wear my nails painted 24/7. Yup people, I wear them to work this way. And yes I dress as a male at work. Oh and yes, they are purple, with sparkles too! 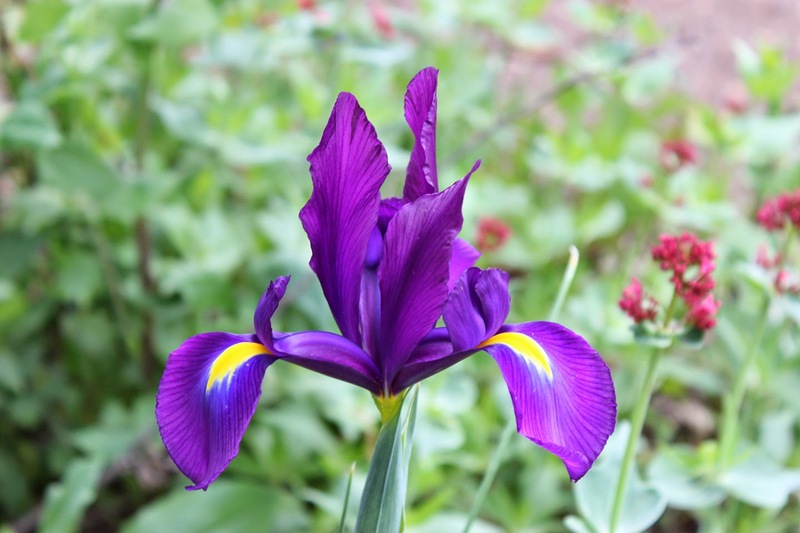 How about a gratuitous iris picture? Have I told you Jules and I grow iris'? Yup, a whole bunch of them. Gosh that one is super pretty. Oh how I love my new camera! Work hard to be proud of you! I've got to say that from the background, it looks like you have a beautiful garden, with some beautiful flowers growing. The new camera really does a great job. This is my favorite time of year to take pictures. Spring in the air, flowers blooming, and people enjoying the good weather, something we'll be doing this weekend. Great outfit by the way, I love how the belt draws the eye in and how with a closer look, you can make out the texture of the black top underneath. Have a great weekend! Yeah I love where I live. Jules and I used to live in the city, Long Beach, but wanted to buy a house somewhere county-ish. So we searched and searched and found our current location. It was a big change moving out to the country and we had to totally adjust, but it has been well worth it. I don't think I could ever go back to a big city now. We have a large yard with a big vegie garden, fruit trees, and lots of flower beds. The only problem with it is that I am the on site gardener and it is lots and lots and lots of work! Tiring, but fun! I hope you are enjoying the spring; apparently everywhere but here in Cali it has been a tough tough winter. Thanks for the complement on the outfit. I too really like the belt with it; it totally just made the outfit. Love your taste Nadine, Do you ever wear any workout clothing such as yoga pants and sport bras? Awww.... thanks that is sweet of you to say. Workout clothes? Hmm??? I do have yoga pants that I wear on occasion, but generally just lounging around the house. I actually wear them the most frequently while dressed primarily as a guy. Sports bras? Nope. I haven't had a need for one yet. But maybe. Now... I do like the style of most active wear for females. Often times my underclothes while hunting are female. Specifically my long underwear, by underarmor, is female. I hate the overly large bulge they often have in the crotch area of men's long underwear. I also really like the colors and fabrics associated with women's active wear. I suppose since I don't do much of my exercising or activities while dressed as a woman I don't seem to be able to justify the expense of them. But again, super cute stuff! The reason I ask is I like to wear yoga pants, and women's jeans. Higher end such as lulu lemon and athleta. I don't know how to wear tops though! I love dressing up but not quite ready to be out of the house yet! You are a inspiration. Thank- you! Recently discovered your blog - njcddresser from another site. Best of luck with your new camera. I'm a semi-professional photographer. My advice, take the time to learn how to use it. Don't just shoot in auto mode. You'll be much much happier with the results! Thanks so much for stopping by and checking out my blog. I appreciate it. What Do You Bring Into Your Life?